This is a special feature of photojournalist and Aqua Image President Hiroshi Takano of Osaka, Japan who was one of the foreign delegates of the Diving Resort Travel (DRT) Expo held at the Megatrade Halls of SM Megamall on September 11 to 13 followed by familiarization tours at different diving sites within the Philippines and included some resort visits and countryside tour. I joined the group of Hiroshi in Panglao, Bohol along with other delegates from the US, Australia, Korea and some of the DRT Expo organizers from China including Jason Chong, lead organizer of DRT Expo in many countries. 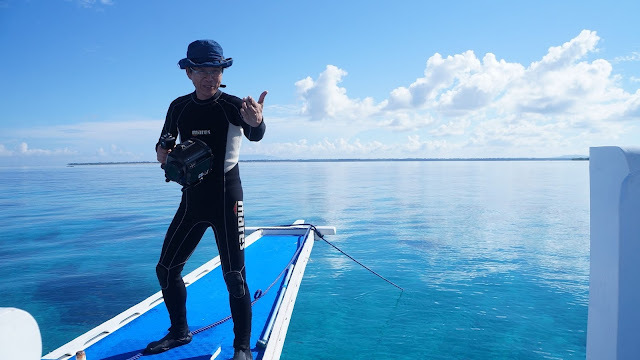 Hiroshi joined the diving tour at many of the popular diving sites of Bohol. He photographs mostly marine or aquatic life. He also talks and sings about water and its precious aquatic natural environment. He performs audio-visual photo-concerts featuring his own photographs and music, including lyrics. This is why he is also called the "singing underwater photographer" playing different kinds of guitars in his performances. He takes the audience on a journey to many places on this planet through his own experiences. Hiroshi has a music CD album called "Aqua Island" and a photo essay "Ayu" with music CD which shows dramatic life of famous Japanese river fish "Ayu." He also has a portfolio of Marine Photos from MP1 to MP6 available both online and in print. He was the most eager in exploring Bohol especially when we went on a familiarization tour where he took photos and videos of the iconic world's smallest primate called the "tarsier." I interviewed him on the second night of our 5-day stay at Amorita Resort after a dinner we had at one of the sponsoring resorts nearby namely Bohol Beach Club who treated us for dinner that night. Get to know more about Japanese Hiroshi Takano who shared stories about his photo concert performances and his passion for marine photography.